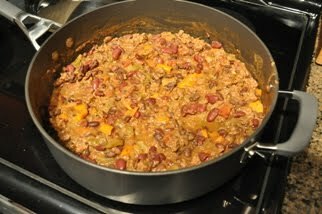 Are you following a slow carb diet, and getting a little tired of the same old black beans and lentils in your meals? And, are you trying to find something else to add to your slow carb menu to change things up a little bit? I was, and after a bit of searching I came across this recipe for white kidney beans with spinach, which fits perfectly within the slow carb diet guidelines. It doesn't need a lot of ingredients, it's easy to make, and most importantly, it tastes good! All you really need are a can of white kidney beans (also known as cannellini beans), and handful of spinach, and some garlic. A few other spices and you've got most of your meal already! I served mine with some chicken breasts which I fried in a bit of olive oil, basil, and paprika. If I had more time, I would have liked to add some roasted curried cauliflower, but I ate raw cauliflower instead. Here's the recipe I made; please let me know what you think! To a large, non-stick skillet, add the olive oil and put it on medium heat. Crush the garlic, and add it with a dash of red pepper flakes to the heated olive oil. Let cook for about a minute. Rinse your spinach in the sink, and then throw it into the pan with the garlic. Be careful, and it will likely spatter quite a bit for a minute or so. Stir the spinach around to coat it in the garlic and oil, until it has begun to wilt. Add the chicken stock (preferably low-salt), and the beans, and mix well. Cook it uncovered for 10-15 minutes, stirring frequently. Cook until the chicken stock has been absorbed by the beans, then remove from the pan. The original recipe suggests to add a teaspoon of sherry vinegar when the stock is almost nearly absorbed, but I didn't have any of that to try. I did add a splash of white vinegar though, and it tasted very good. Also, depending on how long you leave it in the pan, you will get a different texture for your beans. If you'd like them soft and "esthetically pleasing", remove from the pan before they start drying out. However, if you would prefer, you could leave them in the pan a few minutes after the water is all absorbed, which will give a crispy fried edge to the beans. Either way, the taste is really good. As I noted above, I served mine with chicken breast and cauliflower.... a perfect slow carb dinner, ready in under 30 minutes! It's been a while since you posted this, I know, so I wonder if you'll see this comment, but I appreciate your write-ups. Lots of culinary inspiration from this blog! Keep it up!